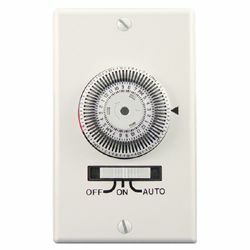 These time switches will provide automatic control of lighting, fans, pumps, appliances, or small office machines. They have 72 captive trippers with a 20 minute switching interval to provide up to 36 on/off events during a 24 hour period. The timers have reliable and accurate synchronous drives. The time switches offer an off/auto/on override switch. The color is white. Three models are available, each of which comes with a switchplate cover for the appropriate size electrical boxe (the timers themselves are identical).